In the 19th century, Long Eaton was a thriving industrial town, mostly producing a large proportion of the famous Nottingham lace, which was sold throughout the world. By the middle of the 20th century, lace had seen a sharp fall in demand and many factories were forced to close. Fortunately, the rise of furniture and upholstery manufacturing was able to fill many of the vacant factories and replace lace as the towns main source of employment. Upholstery manufacturing started in Long Eaton in the early 1900’s with the demand for railway carriage seats and furniture for ocean liners. A number of today's manufacturers can trace their roots back to these early days. 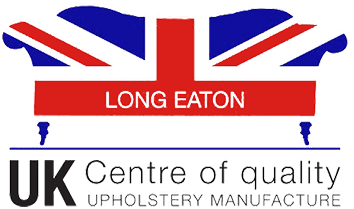 PF Collections have been producing quality bespoke British made upholstery in Long Eaton for almost 30 years. Our furniture is handmade by highly skilled craftsmen and women, using the finest materials available. In addition to using customers own material (COM), we work with over 40 of the leading names in furnishing textiles. Our fabric cutters and sewing machinists are highly skilled and can turn any fabric, no matter how complicated the design, into a perfectly matched piece of furniture. Each piece of furniture is individually handmade by one of our skilled upholsterers, who makes the whole piece from start to finish and is individually responsible for its quality and finish.